For some, doing the laundry sparks joy; but for the vast majority of us, washing clothes, towels, and bedsheets is simply the worst. 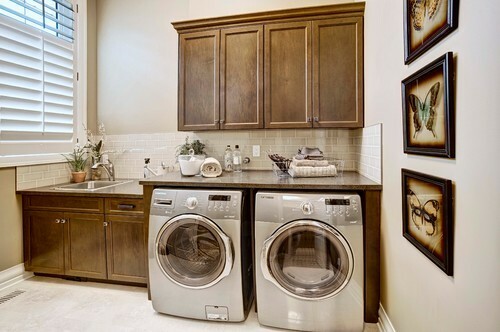 Compounding the misery: Washing machines are often located in dank, dark basements, or crammed into an extra closet, with little care given to the decor or efficiency of the space. 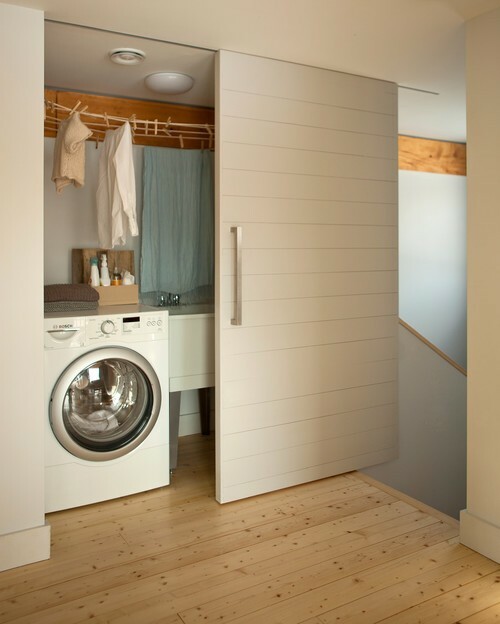 But if you take some time to outfit your laundry area with the most essential (and stylish) features, this task might become a bit more enjoyable. 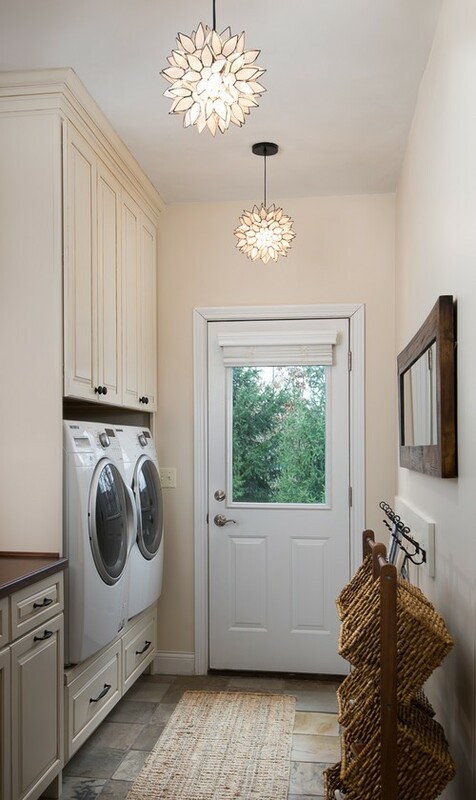 “If you’re lucky enough to have a real laundry room, make the space as inviting as any other in your home,” says Drew Henry of Design Dudes. This means not only considering colors and patterns that’ll enhance the space, but also including smart details that’ll make the job quicker and easier to accomplish. 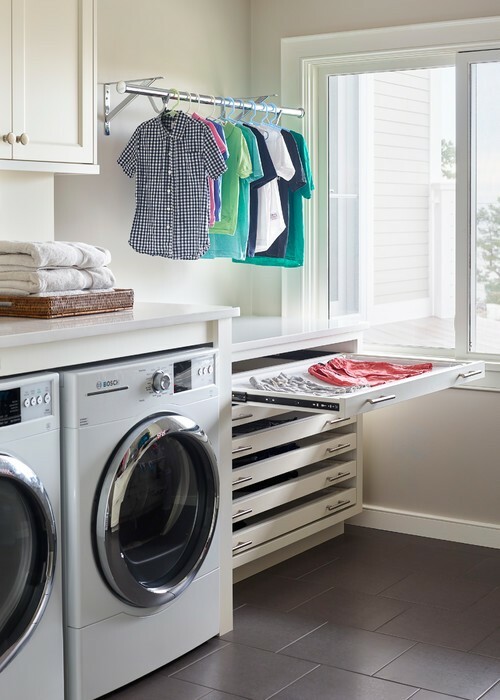 Before you fold any more fitted sheets, here are nine must-haves for your laundry room. Smoothing out wrinkles and folding clothes is infinitely easier on a flat surface. If you have space on top of your machines, you’re good to go. However, you can also install a flip-down shelf from the wall or storage closet, suggests Karen Gray-Plaisted of Design Solutions KGP. Or you might retrofit a nearby drawer with a flat insert for folding. 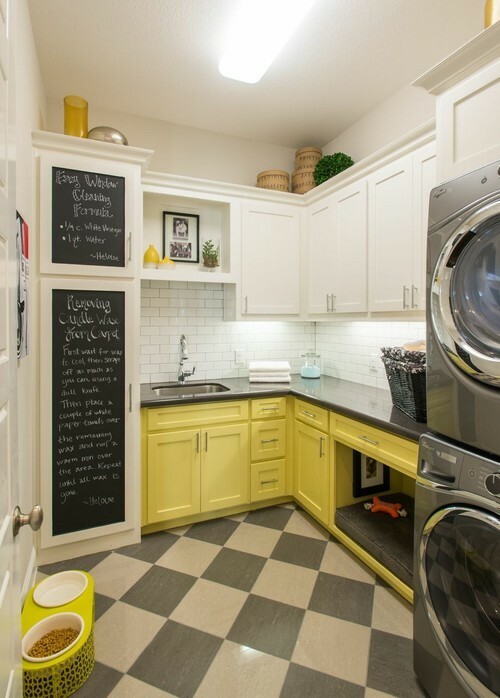 A bold laundry room can put a smile on your face—and it’ll brighten your mood despite having to do a mundane chore, says Liz Toombs, president of PDR Interiors. “If your favorite color is teal but you’d never dare to paint the rest of your house this shade, put it in the laundry area,” she suggests. This space is also a prime candidate for wild wallpaper, a ceramic backsplash, or decorative tiles. Afraid of the commitment? “Add wallpaper to the inside of your drawers or cabinets,” says Anna Brockway, co-founder of Chairish. Washer and dryer be gone! 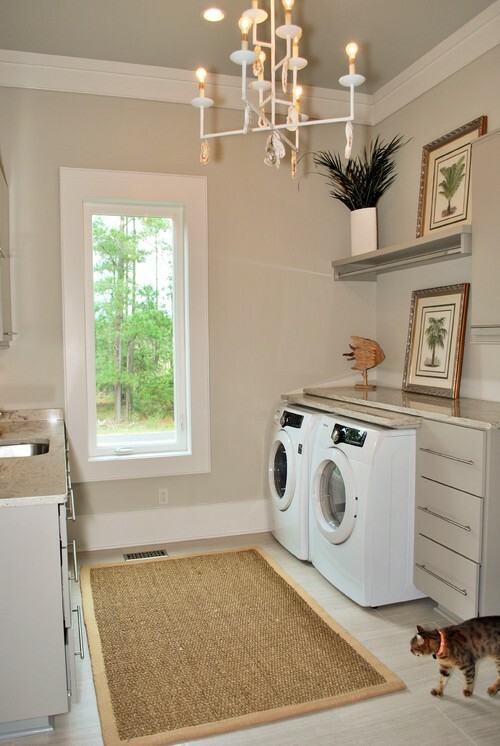 If your laundry room is actually a laundry area, having a sliding door or a simple curtain to hide your units is priceless. “No matter how organized you are, you’ll have detergent on the floor and clothes hanging to dry, so a set of folding doors, a screen, or a room divider does the trick here,” says Toombs. 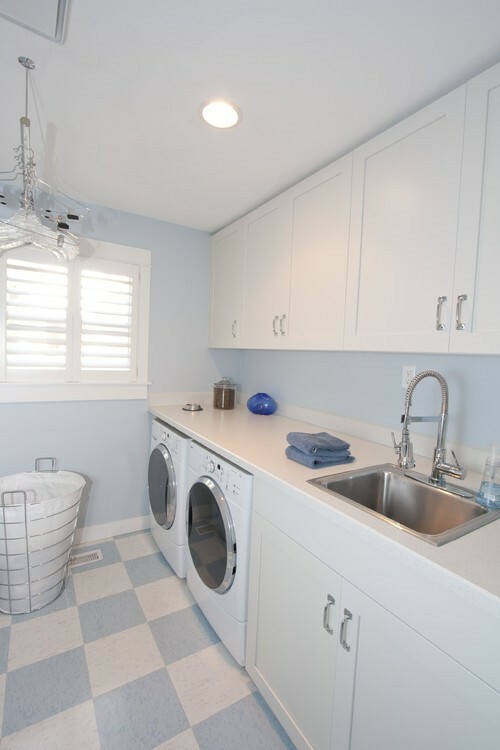 Quality lighting in a laundry room is a must for when you’re sewing on buttons or spot-treating stains. But why not install an interesting light fixture to make the space feel less utilitarian? Toombs suggests a fashionable chandelier or a geometric pendant light. Just make sure the light output is strong enough for your important tasks. With the right tools, laundry duty will be a streamlined and painless process. We promise! 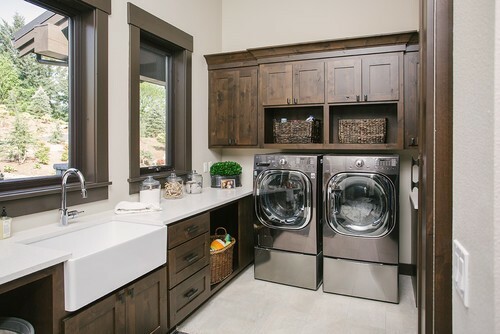 Our experts suggest equipping your laundry area with jars for holding loose change, clothespins, and buttons; a small wastebasket for lint and tags; and a set of beautiful baskets to corral detergent bottles and clothes that need mending. Toombs suggests keeping hangers on hand to hold items coming out of the dryer or wet clothes that need to air-dry. Jamie Novak, author of “Keep This Toss That,” keeps rags in her laundry area for cleaning the washer and dryer (yes, they need wiping down!) and a stain remover guide. “I can never remember what you’re supposed to use to remove mustard, but I know it’s not the same as lipstick,” she says. You may have fallen in love with Brazilian cherrywood flooring, but it won’t withstand a flood of dirty laundry water. The same goes for carpeting. Nonwaterproof flooring just won’t cut it in a laundry area where there’s the potential for dripping water and excess moisture. So choose wisely. 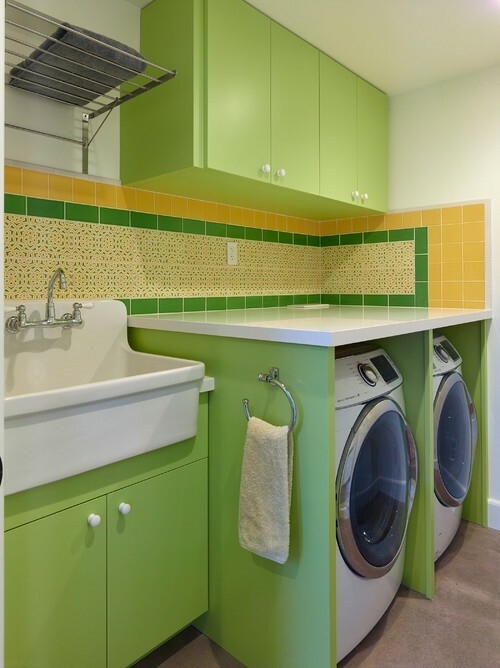 Toombs says some of the best laundry room flooring options are ceramic, concrete, or vinyl tile. How will you remember that you’re out of detergent or fabric softener? Writing your laundry shopping list on a whiteboard will help you keep everything straight. “You can also keep track of family events, the grocery list, and important to-do’s,” says Henry. And you don’t need to spend a small fortune on this feature: An inexpensive dry-erase board or a swath of chalkboard paint on the wall will do the trick. A set of prints or a framed family photo will personalize the space and make it look less humdrum. “Artwork makes the room more inviting, which means you’ll be more willing to spend time here,” says Novak. Julie Coraccio, organizing pro at Reawaken Your Brilliance, recommends placing a chef’s mat in front of your washer and dryer. The cushioned surface will help support your knees and back if you’re stuck doing load after load of laundry. Or try a natural fiber rug, says Brockway. “A durable carpet is great in this high-traffic area as it adds warmth to a room that’s bare and cold because of those big appliances,” she says.